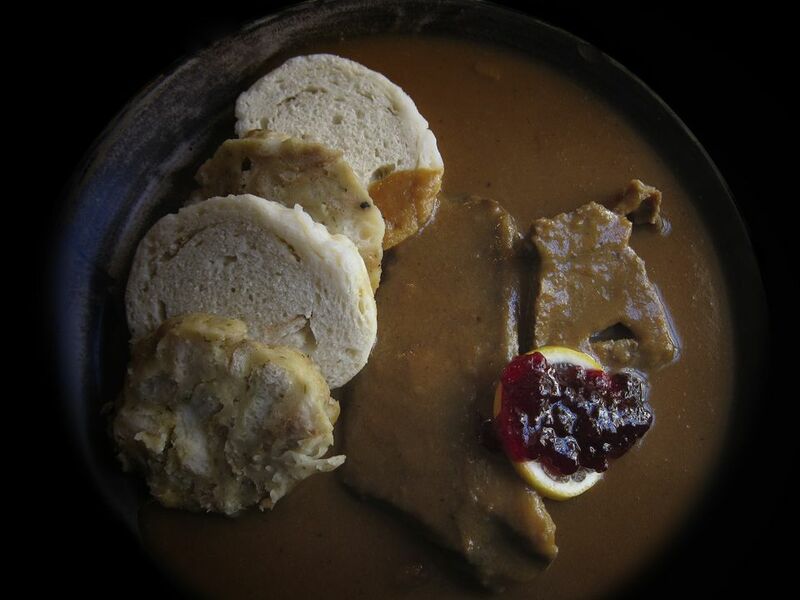 Traditional Czech bread dumplings, houskový knedlík, are considered a part of the national culinary heritage. For such an esteemed dish, they are quite simply made with flour, milk, eggs, and stale bread cubes which are formed into a loaf or roll, boiled, sliced, and served. They're perfect for soaking up lots of gravy and are typically served with roasted pork loin, roast pork with sauerkraut, roast goose and roast duck, chicken paprikash, roast beef and dill sauce, goulash and many other dishes. See this similar Hungarian bread dumplings recipe. Sometimes bread dumplings are made with yeast as in this Polish steamed dumpling recipe, except the latter does not call for bread cubes. In a large bowl, whisk together flour, baking powder, and salt, and set aside. In a separate medium bowl, whisk together egg yolks and milk. Pour egg-milk mixture into the bowl with flour. Work the dough with a Danish dough whisk or your hands or by machine using the dough hook until it no longer sticks to the bowl. Put a large stockpot or saucepan of salted water on to boil. Work the 4 cups of bread cubes into the batter until well incorporated. Using floured hands, shape the dough into 3 or 4 rolls that are about 8 inches long and 2 1/2 inches wide. When the water is boiling, carefully slip the rolls into the water, giving them a stir so they don't stick. Reduce heat, cover and cook 10 to 15 minutes. Using a slotted spoon, remove one dumpling from the pot after 10 minutes of cooking and test for doneness by cutting through the middle of the dumpling with a thread or thin knife. If it is done, remove the dumplings one by one and slice into 3/4-inch pieces again with a thread or sharp knife. Repeat until all dumplings are removed from the water and sliced. To reheat leftover dumplings, place the slices in a steamer basket and steam a few minutes until soft. Leftovers are delicious browned in butter and sprinkled with sugar as a special breakfast treat.